Features contains the option to embed the WordPress poll to your content or display it as a modal style, like a popup. Success of a website highly depends on the visitors, therefore customer satisfaction survey is the key to improve the content. The plugin able to visualize all questions on the same graph to display the aggregated survey results. It should be perfect to check the effectiveness of a Support Team or any other Company activities. Modal Survey WordPress Quiz Plugin is GDPR compliant, find the details by clicking here. Trivia Quiz one of the most popular quiz style nowadays on the social networks. The idea behind this WordPress poll to get lot of traffic, especially from Facebook. The plugin offer a share button to post the individual quiz results with specific image to Facebook based on the answers. With this BuzzFeed kind of quiz, that using personal content, the traffic of your website can be increased quickly without spending lot of money for advertising. Increasing the sales with Product Recommendation Polls is so easy. The plugin support conditional statements, that allows you to display a specific message or redirect the browser to any page based on the survey answer scores. Entertain your visitors with a quiz could be also a great option to create pages, that more likely will be shared on the social networks, including Facebook or Google Plus. The quiz timer can be set as a general quiz timer or a question timer to make your quiz more exciting. The plugin customization features allows to create unlimited WordPress poll, survey and quiz styles with many settings and options. Width and position can be specified simply with a slider and colors by a colorpicker. This type of the WordPress questionnaire you can see below, using the 40% of the full width, but you can set any sizes and positions around the screen, even it would be the top, middle or the bottom of the page. Visual Builder helps you on the admin to design a well-looking WordPress poll and attract your customers for voting instantly with your modern, AJAX-based WordPress survey. 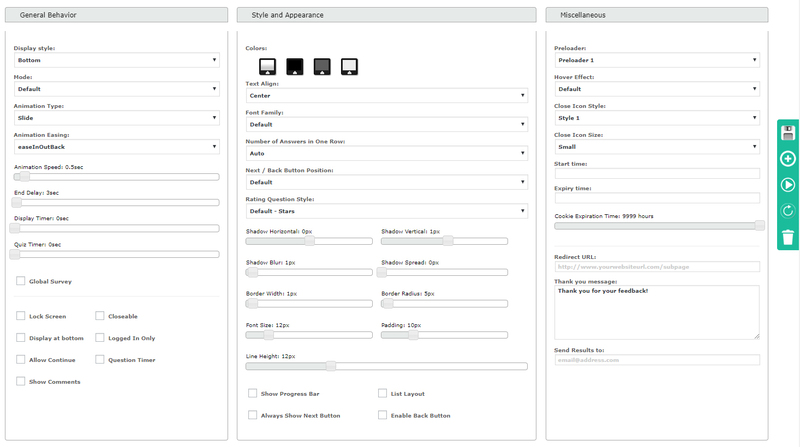 The admin panel grants you a professional interface to design your questionnaire, including RGB Color Picker to set the font and background colors, DateTimePicker for scheduling your WordPress quiz, sliders to set the correct values, like border-radius, padding and you will find much more useful, user-friendly tools on the WordPress survey admin panel. There are tons of customization options in the Visual Builder of Modal Survey – WordPress Poll, Survey & Quiz Plugin, including Live Preview, start and expiry time, font family (650+ Google Font Styles), font sizes, padding, border parameters, background-, font- and border colors and much more… All of them designed to helps you to build amazing questionnaire through a user-friendly, professional interface. Full variety of jQuery Easing Effects and the speed option ensures smooth animations, including incoming and the outgoing behavior of the WordPress questionnaire. In addition, several special features extend the usability of the WordPress quiz for custom purposes. Combine Lock Screen with Closeable setting to force the users to fill out the poll or simply use the first option only to highlight your questionnaire for the visitors. Also grants you the ability to pop in the WordPress poll, when the visitor almost reached the bottom of the page with the mouse scroll. This special event gives you a smart control how your users meet with the survey at a first glance. Add your own, custom message even with link at the end of the WordPress questionnaire. The plugin allows you to offer a downloadable content in return for the information you ask in the quiz. The WordPress questionnaire can fit to the entire page width or can be set to a boxed, smaller size. This full width type of the poll is a solid manner to get the attention of the visitors and it works effectively. The plugin provides much more features that helps you to save your time and reach your aims. The poll can be appear for the users at once, it is possible to set to display once for users who already filled out or simply can appear in every cases. Activate the poll with different user interactions, like click on a link, scroll to the bottom of the page or even scroll to a specified part of the page. Each questionnaire can be closed or you can force the users to fill out the survey in return for the content behind the poll. Modal Survey – WordPress Poll, Survey & Quiz Plugin can be really helpful to get feedback about your posts including even a simple customer satisfaction questionnaire at the end of the posts. With the Rating System feature, it is possible to display stars instead of text answers in your poll without any limitation regarding to the number of scores. It means you can create 5 stars, 10 stars or even 12 stars to get feedback as a score for the voting. It provides an option to display progress bar for any type of the WordPress survey, including quiz or a simple survey. Also brings you the opportunity to insert images to the questions and the answers. This options makes the voting more fun and you can create much better looking WordPress poll with photos. 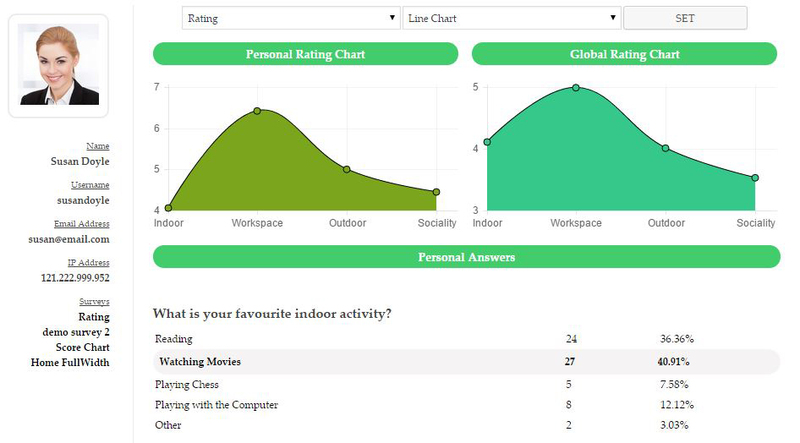 Easy to add individual chart based on the user’s score, rating or correct answers at the end of the WordPress quiz. It provides attractive and useful visual display about the given answers. Various charts help you to get the appropriate display to make the best analysis about the participants and the quiz. Setting up a Quiz is quite easy, you have to specify the corrects answer(s) and/or the answer score, then the Quiz will be controlled by the given correct answers or the final score. The plugin allows you to simply include the WordPress questionnaire to the content anywhere on any page, post or even in a text widget. The poll will appears with a smooth animation when the visitor scroll down to that place where you included the WordPress questionnaire. If you looking for a Customer Satisfaction Poll Plugin, it is a great choice to use it at the bottom of each posts. Needless to say, it is also possible to set the poll immediately visible without any animation or make the WordPress survey visible when the visitor reach a specified part of the content. Embed poll mode provides the same features regarding to the customization like any other type of the questionnaires. If you use it as a Customer Satisfaction Survey, all results will be available on your admin panel to analyze or even export the WordPress survey results to PDF, XML, CSV, XLS and JSON. The WordPress quiz with embed style visible for the users who didn’t fill out the poll previously, therefore it won’t be displayed to the content when it’s not necessary. Getting feedback about your pages is a must to make a well-built WordPress website. Embed Questionnaire can be implemented to the default WordPress text widget as well. The Quiz using table style for displaying the answers, but you can set classic poll list layout with a single click. In this mode, the survey answers will be displayed below each other. Easy to add open text answer to each questionnaire questions to get customized answer for your questionnaire. The autocomplete feature helps for the users to select an option from the previous visitor’s answers. 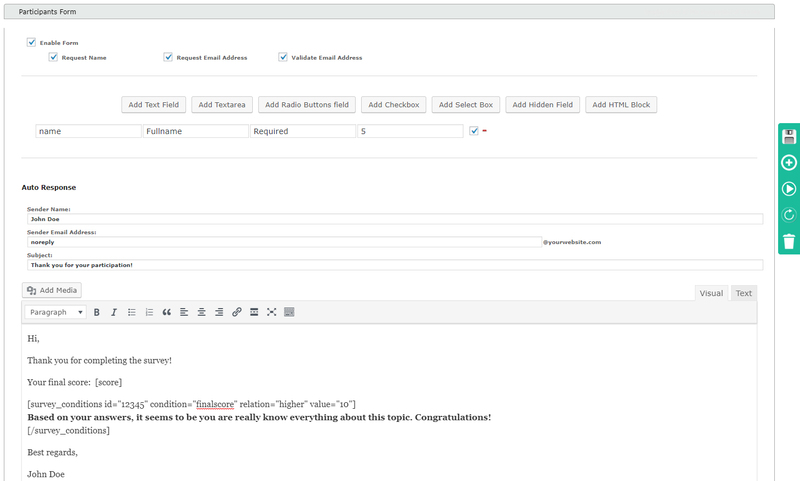 It is also possible to disable the autocomplete function, therefore the text answer field can be used for getting email address or any non-public input. Using a select box with list of answers makes more easy to organize the choices in the WordPress quiz. Simply specify the comma separated list of quiz answers on your admin and the plugin will automatically display them in a select box. Getting numerical answer is essential in many cases. The minimum, maximum and step values can be set on your admin, then the plugin will automatically show it as a jQuery slider in the answer area. Create appointment or use the Date answer to get an exact day for any purpose, such as notification, meeting or reserving. When the date answer set on your WordPress admin, the date can be selected from a calendar in the survey.. In some cases, you would like to redirect the user after completed the WordPress questionnaire. This optional feature has been included directly into the WordPress quiz settings, you have to specify the redirection URL only and the plugin do the rest. Creating conditions based on the result of the questionnaire / quiz will ensure you an excellent option to redirect the user to a specific page or display a message for the user. It can be extremely useful for creating a Product Survey, Promotional WordPress Quiz or even a Horoscope. Votes can be displayed in various formats, one of the most effective is the progress bar style. It is also possible to include the WordPress poll results via text format, then you can compose your article with dynamic variables. 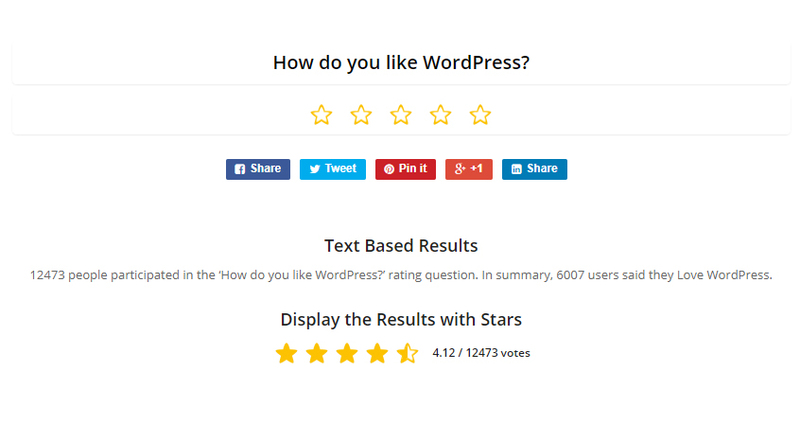 Simply display the full WordPress quiz results or filter it to any question or answer to get the information from the quiz, that you exactly want. Modal Survey – WordPress Poll, Survey & Quiz Plugin offers a total of 6 different WordPress poll chart types, excluding the further styles to show the WordPress questionnaire results, like Progress Bar, Line Bar the Text Format. 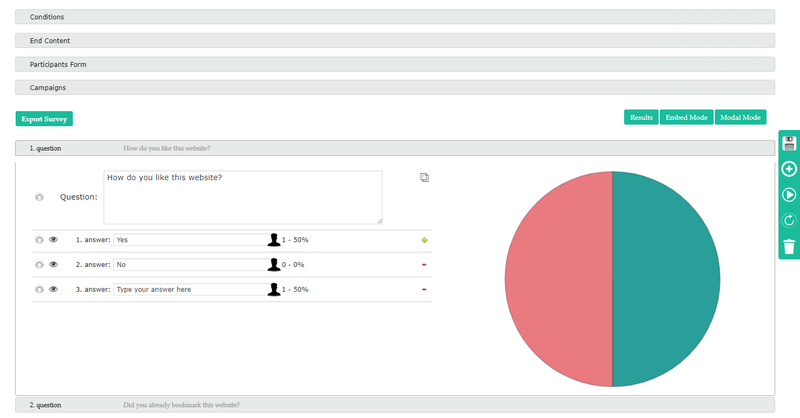 With the most popular Pie Chart, you can demonstrate any questionnaire voting information as you need. The plugin also able to show the results for the active poll and it is refreshed immediately as the visitors voting. 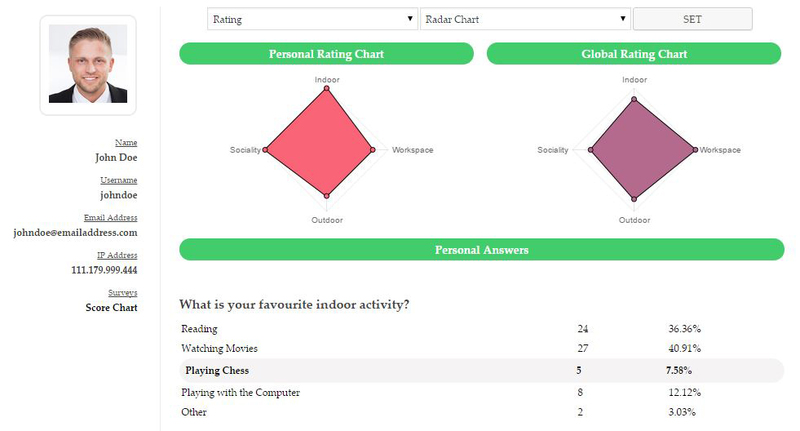 If you need a special type of chart, feel free to select form a Doughnut Chart, Bar Chart, Radar Chart, Line Chart or Polar Chart. These are responsible to visualize any poll, questionnaire or quiz details in a nice, modern way. 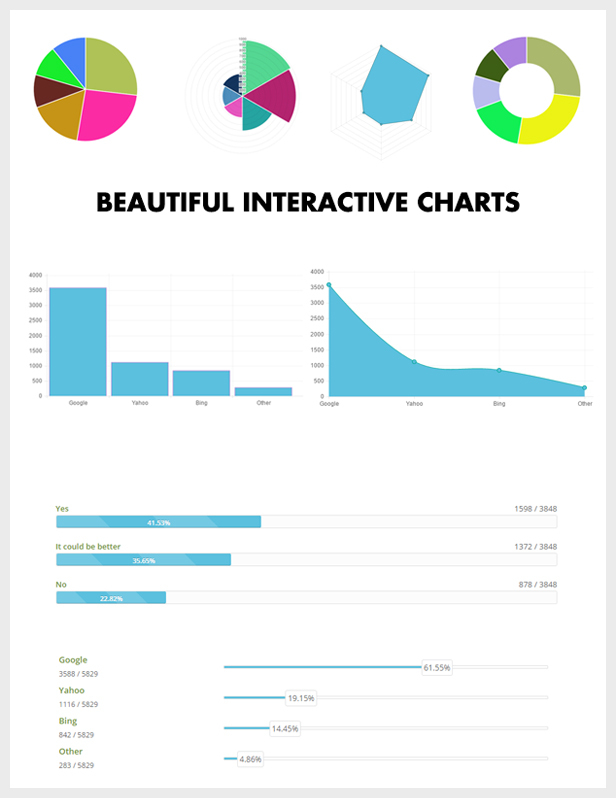 All charts are interactive, display the exact values of the WordPress poll with a mouse hover event. However, you have the option to hide these quiz values using the progress bar or the line bar, including the percentages only. With Modal Survey – WordPress Poll, Survey & Quiz Plugin, it is really easy to manage WordPress shortcodes. Contains a built-in Survey Shortcode Manager to helps you to include the poll shortcodes quickly with only few clicks. Just select what you would like to display (the questionnaire itself or the results) then you will see a dialog to customize the entire poll shortcode. Documentation contains all of the available parameters for the survey shortcodes, therefore advanced users can simply use the WordPress WYSIWYG Editor. The poll shortcode options can be easily selected by the following popup window, therefore you don’t need to write any line of code. Export the whole WordPress poll with the results to CSV, JSON, PDF, XML, XLS. The PDF Export can include the chart for each questions to your PDF document and you also have the option to export your PDF without the charts. Each poll export has a separated template file, therefore with some knowledge of CSS it is simple to customize. To make the customization more easy, the PDF header text available for edit in the general settings of the plugin. One of the most useful plugin feature, simply control the next poll question for the users depends on their answers. Just specify the number of the next question in the quiz under the Redirection field in the Answer Options and the questionnaire will automatically jump to the specified quiz question. It is also possible to define this question number in brackets right after the answer text. As a result of this conditional behavior you will get detailed information in the WordPress questionnaire, even you can filter the quiz by specific conditions. If you want to create the poll for females only, the first question would be the gender and you can send all users with ‘male’ answers to the end of the WordPress questionnaire. Modal Survey – WordPress Poll, Survey & Quiz Plugin offers the option to specify the number of selectable answers by the users and it is also possible to set the required minimum number of answers for each questions in the poll. These numbers can be specified for each questions in the poll, thus the overall questionnaire can be highly flexible. Works like a checkbox and radio button, the difference only it is displayed with a more professional, unique way with underlined answers. Certainly, the traditional radio buttons and checkboxes also available in the poll optionally. Just simply turn on the Participants Form and it will be automatically embedded at the end of the survey, then the plugin will pass the user’s name and email to your chosen newsletter campaigns through your site. Each row gives you detailed informations, including the creator username, create time, last update and total votes. Furthermore, this list grants prompt actions to duplicate, edit, delete or reset the specified questionnaire. Important to note, nobody want a WordPress Poll Plugin that won’t gives realistic statistics. Avoid and minimize duplication with keeping the WordPress questionnaire simple as possible is the main goal of Modal Survey – WordPress Poll, Survey & Quiz Plugin. General settings provides the possibility to display each poll for once to the same user regardless the visitor gave answers or not. Another option to display the quiz once for users who already filled out. Modal Survey – WordPress Poll, Survey & Quiz Plugin doesn’t require registration to get as much votes as possible, it is using cookies to prevents duplication. As an advanced solution, the poll can be displayed for logged in users only, this way the plugin will using your WordPress database to validate the user and allows voting one time only. Creating backup or copy your questionnaire to your other website has never been easier. The plugin ensures the option to export you poll in JSON format and simply allows to import back the JSON quiz file that has been exported before through the WordPress Plugin admin area. Releasing constant updates of Modal Survey – WordPress Poll, Survey & Quiz Plugin based on the needs periodically. To keep the updating process easy as possible, just download the new version and upload in the Modal Survey Update Page through the admin and it will do the rest. Also offers the choice to terminate to update after you read the new version changes and decided to keep the old version. What Clients Think about Modal Survey – WordPress Poll, Survey & Quiz Plugin? If you have any question or feedback, please feel free to email me via my user page contact form. You can also check the Support Forum, the issue maybe has been solved before. The plugin’s FAQ also contains some useful informations about how to use this plugin. After you purchased the plugin, go to the Downloads and set the checkbox to on. You can also rate the plugin there. Check out the latest changelog here. Purchase one extended license for each theme you want to sell on any Envato Marketplaces, then drop me a line via my profile page mail sender and I will add your theme link to this page. Before you send a refund request, please make sure you already contacted with the support here and provided your website URL. If Modal Survey – WordPress Poll, Survey & Quiz Plugin doesn’t work as it described and the problem is with the plugin, that can’t be fixed in 48 hours, then you can get a full refund.